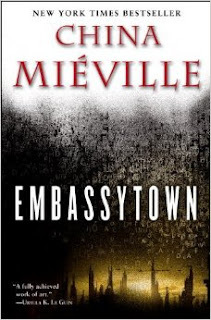 I really like China Miéville. He writes weird fiction, and he's one of those authors you either love or hate, and I love him. I've read everything he's written, but I have to say my favorite was Embassytown. This book tells the story of a human colony on an alien world, and the very unique language spoken by the sentient species that lives there. Because I listen to China's books rather than read them (trust me on this - a far better experience), the audio artists were able to give a gross approximation of how this language sounds. I always find China's books entertaining, but they usually have a larger point, as well. In this case, my takeaway was an anthropological one pertaining to the dangers of cultural contamination when different cultures collide, conflicted loyalties, and the perils of dedicating one's life to the "foreign service."